I called the Google Adwords support telephone number recently to try and get some answers regarding the renewal of my Google Advertising Professional certificate. I called Google ( 1-866-2Google) because I couldn’t locate the link for signing up for the Advertising Professionals exam within My Client Center. 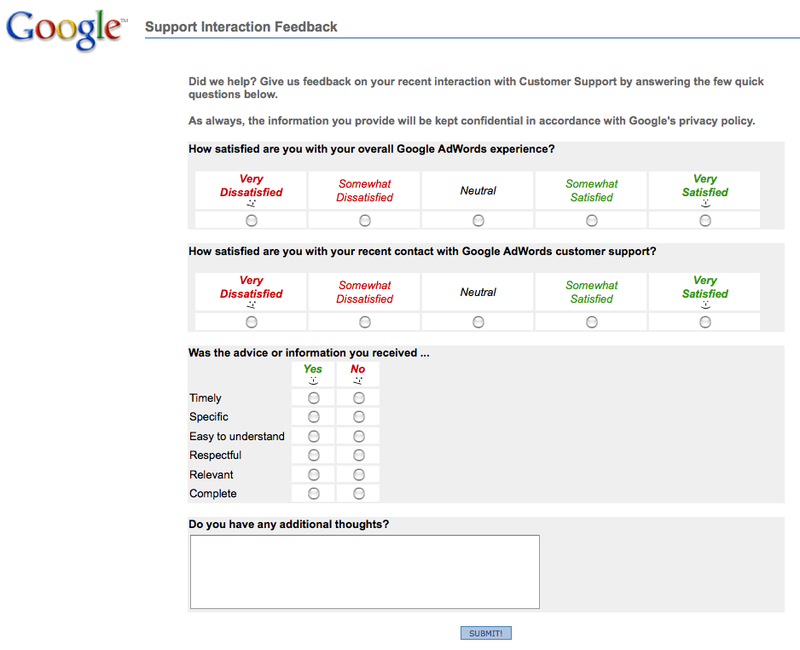 After the call, I received by email the first Google Adwords related “Support Interaction Feedback” survey I can recall getting after having called Adwords support. I was pleased to learn Google cares enough about what their customers think that they now go so far as to ask us what type of experience we had with Adwords. Thank you for contacting us about your query 544910863. We are eager to hear about your AdWords experience. * Find out more about GoogleRatings.com at …. Please note that this survey is confidential. GoogleRatings.com is a domain used by Google for conducting customer and user surveys. We rely on feedback collected through these surveys to improve our products. Timely, Specific, Easy to understand, Respectful, Relevant and Complete? ﻿﻿Coincidentally, my upcoming book addresses six similar communication metrics. This entry was posted on December 1, 2009 at 8:21 pm and is filed under 1-866-2Google, Communication Metrics, Google Advertiser, Google Advertising Professionals Exam, Google Adwords Support, My Client Center. You can follow any responses to this entry through the RSS 2.0 feed. You can leave a response, or trackback from your own site.